There are few times in your career when you are truly surprised and humbled by events at work, for me, the last 6 months with our ethical premium coffee brand Perkee has done just that. Our little Perkee Coffee brand has beaten most major global coffee brands in client blind tastings, amazingly enabling bartlett mitchell to open 50 Perkee sites! Back to being surprised, due to Perkee’s growth, the quality of bean, the taste and positive social impact, has made Perkee the most successful own brand coffee in the UK contract catering market. This is all very impressive, however there are really two important groups of people who cannot go unmentioned. Firstly the Nicaraguan farmers working with the Soppexcca Cooperative ably led by the charismatic Fatima. In early 2018 we will be bringing the stories of Perkee’s Fairtrade impact of on the Soppexcca communities. Secondly the fabulous bartlett mitchell teams that have adopted Perkee as part of the family! From baristas, board, operational teams, coffee brand managers, it’s a very personal project that the team have taken to their hearts! Nowhere was this more evident than at our inaugural bartlett mitchell Barista Competition “bmbc”. After UK-wide heats to identify the “best of the best” the finals were held late October. 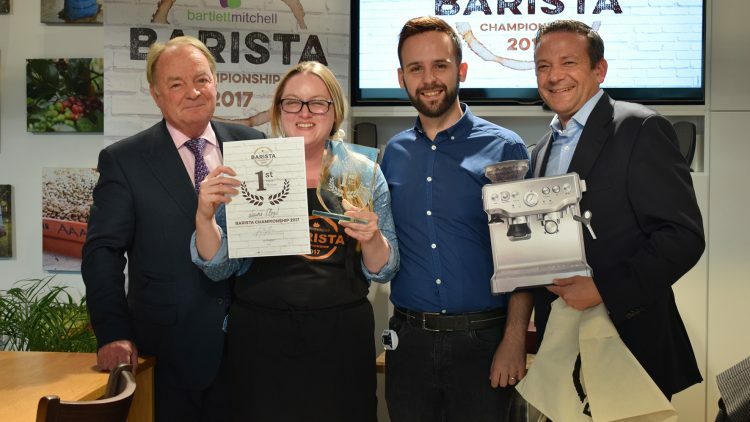 Our coffee partner Bewley’s, kindly provided the fabulous facilities for the competition including state of the art grinders, competition judges, machines and clever live on screen feeds for supporters viewing! Support for the finalists was overwhelming with the majority of the board and operations teams there to cheers them on. We were delighted that all 7 of the finalists used our newly launched light roasted retail single origin Perkee. Each of them demonstrating both the passion and skills of our coffee making teams. Miguel our coffee brands manager who organised the event was visibly proud to see the effort, and particularly the creativity in their signature drinks. The winners were…. Ian Mitchell and I were privileged and humbled to present the winners with fabulous prizes. We want the annual bmbc competition to be part of the bartlett mitchell’s focus on excellence in craft skills. Not only does it nurture team development across the business, but it also recognises the importance of great barista skills. We are delighted with our special Perkee brand and 2018 is on track to be even more exciting, and likely more surprising and humbling too!